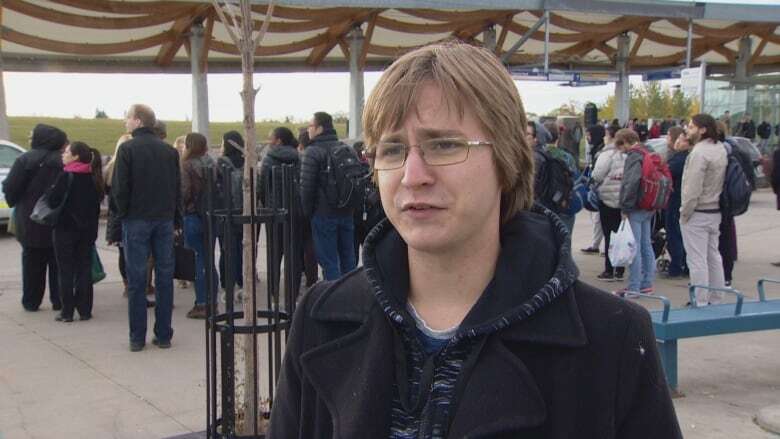 Charges are pending against a 24-year-old man after a teenager was stabbed numerous times in an unprovoked attack Tuesday morning on the South Campus LRT platform. In a series of events police are describing as a crime spree, the suspect allegedly fled the scene of the stabbing, robbed a nearby store, assaulted a shop employee and stole a getaway car before getting into a scuffle with police in west Edmonton. Investigators do not believe the suspect knew any of the victims. The stabbing victim is in serious but stable condition in hospital, Alberta Health Services spokesperson Kerry Williamson told CBC News. 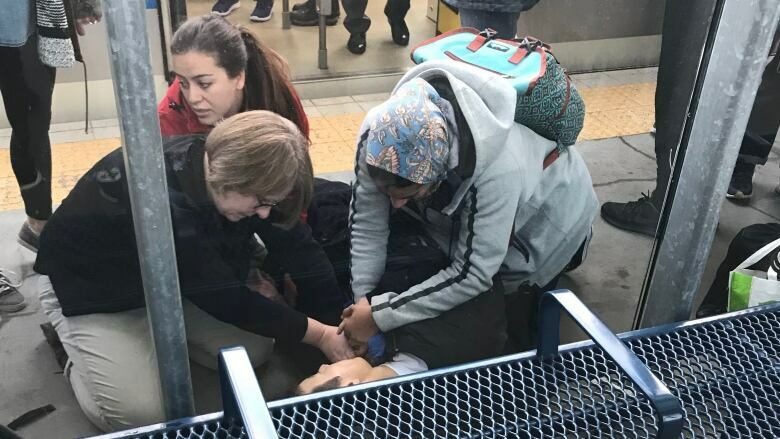 Officers were first called to the train station around 7:40 a.m. after a 19-year-old man was stabbed in the chest while waiting for his train. Police initially indicated that the victim was 20 years old. Jason Cey, 22, was on his way to a class on campus when he saw the man being attacked, just a few feet away on the busy platform. The man cried out for help as he was repeatedly stabbed in the chest, Cey said. "The guy was stabbed multiple times by another young guy on the train platform. He was stabbing the other guy with a long kind of switchblade silver knife." The attack was sudden and unprovoked, Cey said. "I couldn't see a fight at all beforehand. The guy seemed to come out of nowhere and started stabbing him." Cey said he and a few other commuters rushed to intervene in the attack. "A couple of guys pulled off the assailant, and I helped the gentleman who was wounded to the ground," Cey said. "I put some pressure on his wound and called 911 immediately, and just waited there for EMS and the cops to show up." A doctor and nurse who were on the platform also jumped in to help. The South Campus LRT station is two stops south of the Health Sciences station, with its proximity to the University and Stollery Children's hospitals. Cey said the injured man remained conscious and responsive until paramedics arrived minutes later. "I'm feeling a little bit bad that I didn't do more to see what was going on, but at least I was there to help the guy," Cey said. After the stabbing, at about 8 a.m., police were called to a robbery at a Petro-Canada near 57th Avenue and 111th Street. A man entered the business, assaulted an employee and stole merchandise. The man then went outside to the parking lot, and demanded that a driver take him away from the scene. When the woman refused, the suspect allegedly jumped into her vehicle on the passenger side and grabbed her. The woman was able to escape from the vehicle, police said. The suspect then reportedly stole the woman's 2017 Cadillac XTS and drove south on 111th Street. The male employee was treated on scene for minor injuries. The driver was unhurt. Police used an electronic vehicle monitoring system to track the stolen Cadillac. It was found parked behind a business near 179th Street and 106A Avenue. As officers arrived, the suspect tried to drive away but was blocked by police. When the suspect got out of the car, a brief altercation ensued. Then man broke free and ran off. At about 8:30 a.m., with help from a police dog, officers arrested a suspect in the area of 181st Street and 107th Avenue. At an afternoon news conference, acting Staff Sgt. Neil Thompson commended bystanders who jumped into action on the LRT platform. "They were a huge help, and I definitely commend them for quick actions," Thompson said, adding he had seen video of the stabbing. "The main fellow that intervened, it looked like it was just a natural reaction. I don't think he even had time to think about it. But there's no doubt in my mind he definitely played a part in helping that fellow or saving that fellow." Thompson said the Cadillac's OnStar navigation system helped police quickly pinpoint the stolen car's location, leading to the arrest of the suspect, who was known to police. "OnStar was definitely a big help in locating the vehicle," Thompson said. "We had suspect description, vehicle match, but with the help of OnStar it was much quicker than if we were simply broadcasting to other divisions, other units." Cey said he was rattled by the sudden attack on the LRT platform. "You like to think that you're safe in public," he said. "But I guess not." Mayor Don Iveson said public transit is generally safe because there are people and cameras around. "There's a lot of deterrents in place that mean when something like this happens, the likelihood of holding someone accountable is higher than if it just happened anywhere else," Iveson said. "I do understand they're upsetting and concerning for people. I was almost on that train this morning. If I'd taken the train this morning that would have been about the time." The stabbing created delays for early morning commuters, with LRT service suspended at the station and transit users being shuttled by replacement buses. The disruptions ended just before 10 a.m. when ETS said it would resume scheduled service.